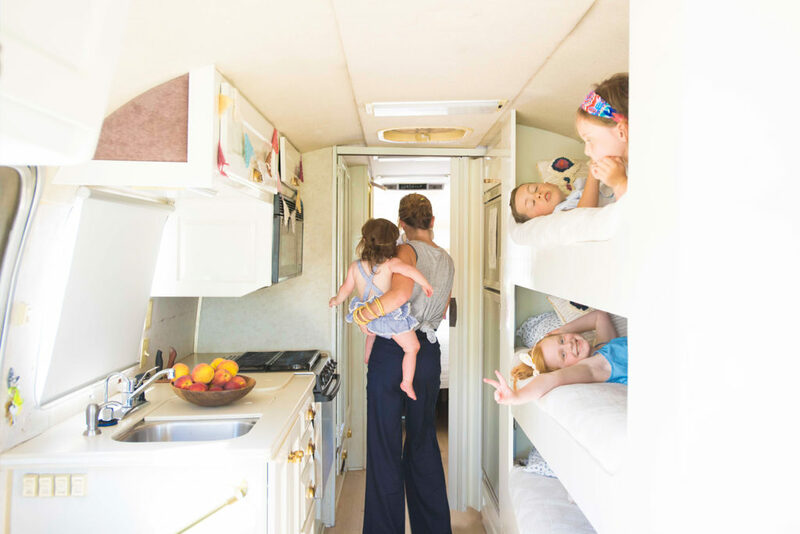 Ben and Jen Coats hit the pause button on their busy schedules and took their family of seven on a six-week road trip in a 35-foot Airstream. Carpooling, work meetings, grocery shopping, baseball games —and that’s all in a day’s work for home builder Ben Coats and his wife, Jen. 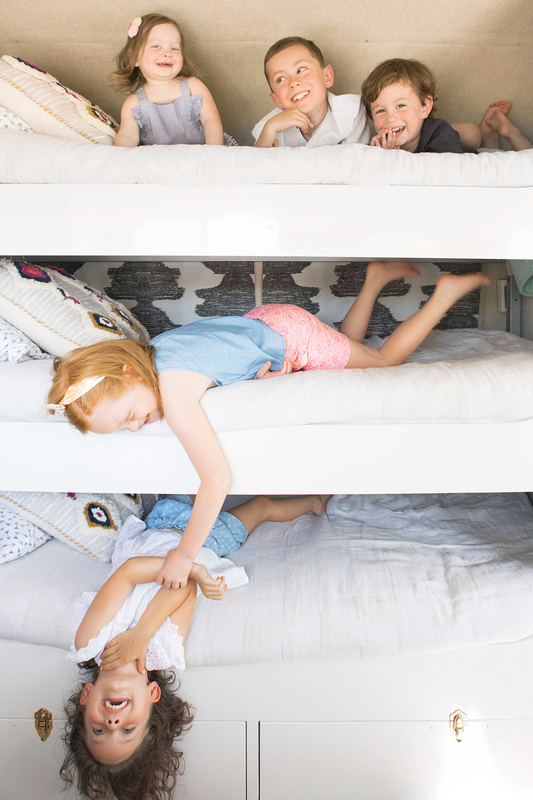 Managing five children—ranging in ages from 8 to 1—and running a business left the family with hardly any downtime, and it was time to step back and assess. “Jen had this idea to go on an adventure,” Ben says. “We wanted to have an extended period of time with the kids because life can be really busy.” Jen’s genius solution? Buy an Airstream, load up the kids, and explore the U.S., meeting strangers and kindling new friendships along the way. “[Kids] think the world revolves around them,” Jen says. “We wanted to show them and be examples of what it really meant to love other people.” Here’s how they pulled off the ultimate family road trip last summer that taught them how to slow down and relinquish the schedule. Jen stands in the kitchen, which they decked out in designer finishes such as Waterworks pulls and Fine Paints of Europe. 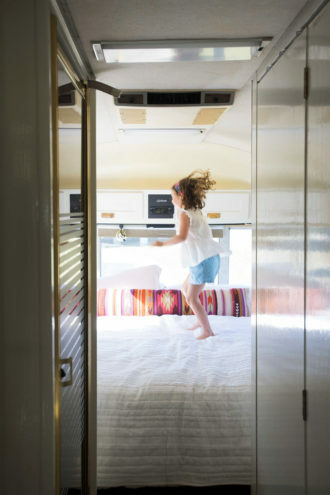 “We wanted a beachy, bright vibe,” says Ben of the changes they made to the Airstream’s interior. A view of the “master suite” that Ben and Jen designed, complete with a Rocky Mountain Mattress. Ben was in charge of finding their mode of transportation and mapping out their route. The rough plan was to start in Texas, head north toward Colorado, Utah, Wyoming, Idaho, and Oregon, and then explore down the Pacific Coast before heading back home. They didn’t reserve spots at campgrounds or RV parks—they didn’t want to be on a schedule. Although stressful at times when they didn’t have a spot to pull over, the unscheduled philosophy paid off. “The most fun part was the adventure between spots—getting to the places,” Ben says. The couple poses in their 35-foot Airstream. 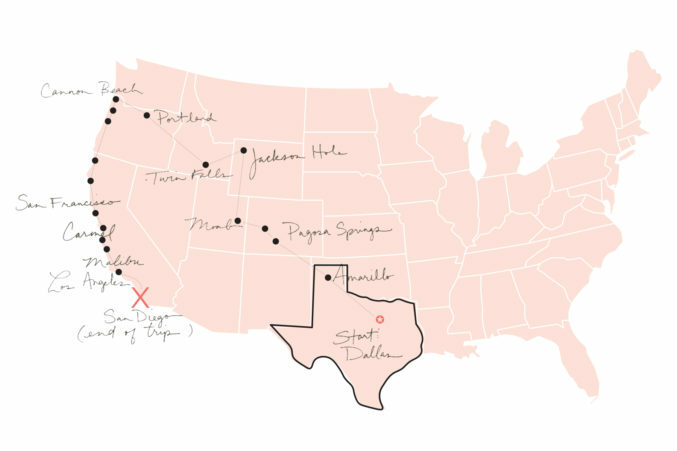 Their first stop was to reach Palo Duro Canyon in Canyon, Texas, just six hours northwest of Dallas. But they didn’t make it 30 miles before it broke down. “Our first night we stayed in a beer barn outside UNT stadium,” Ben says. Once their Airstream was road ready, they continued on, skipping Palo Duro Canyon and heading toward Pagosa Springs, Colorado. Because they didn’t have a car attached to their Airstream, they had to rely on Uber to explore each location. But that brought its challenges, too. “We got left in Pagosa Springs,” Ben says. “We had an Uber take us to [a trailhead], and we asked him to come back in 45 minutes—and he never showed up. We had to hitchhike back,” he says. The Coats family would get used to hitchhiking (safely) and relying on strangers: At one point, they were stranded in a no-cell phone coverage zone, and they made signs, waving to passersby hoping they’d dial 911 for them once they reached service. “Two hours later, a policeman showed up,” says Ben. But the family kept going. “The first two weeks, I remember looking at Ben and saying, ‘Should we continue to do this?’ Everything was going wrong,” Jen says. They explored Telluride, Colorado, Moab, Utah, and Jackson Hole, Wyoming, before moving through Idaho, Oregon, and down the California coast. While on the Pacific Coast Highway, the Airstream broke down once again, and their ride shut down traffic on the PCH for half a day. “I was literally in shock,” Ben says. “There were many learning moments.” Often, the Coatses didn’t know where they were staying, but once they got to a campsite, it ended up being their favorite part. “There are all these people that have a similar mindset of wanting to explore the country and build and create relationships,” Ben says. When the transmission blew out in San Diego, that signaled the end of the trip. Even though the Coats family didn’t set off for another adventure this summer (they hope to take mini trips around Texas), they learned the importance of allowing their family to have more free time. “When you can live life without going to this meeting, going to this place…when you can clear your schedule, life happens. That’s what we experienced. We didn’t have an agenda. 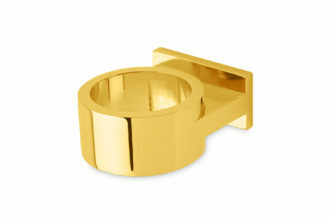 Between point A and point B, life happened,” Ben says.